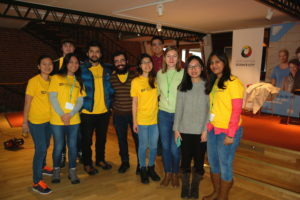 “There is such a buzz amidst the silence of brilliant minds all working together for a common goal.” Santosh Hejmadi from TF Sweden explains what happened at the ARctic Challenge, the first Techfugees hackathon to take place in Sweden. Who took part in the ARctic Challenge? We had 50 participants including people from tech companies, along with immigrants and students from various parts of the world studying at the nearby Luleå Technical University (LTU). They came from Skellefteå city, Umeå city as well as Lövånger, Jörn, Skelleftehamn – this is where most of the refugees live. It all took place over the weekend of 19 November 2016 at The Great Northern, Skellefteå’s new innovation arena, and was run by Skelleftea Digital Alliance and the Smart Sense Region Project in collaboration with the municipality of Skellefteå, Smart Growth, Science City Skellefteå, Luleå University of Technology, and Techfugees. One of the tasks for the participants was to suggest in augmented reality apps that can help newcomers and refugees integrate into society. We started off with eight teams, including two teams whose members were refugees themselves. However, one of these teams could not come on day two so the final count was seven. Whilst all of the apps were interesting, one finalist and one runner-up were selected by a jury of four. First prize went to Skellefteåll who developed an interactive game for children, tourists and immigrants to get to know Skelleftea. You take a picture of a building or an object in town, and the app recognizes the object and tells you what it is. You also get points by collecting the items. On the team: Olga Rybnytska, Felipe Leon, Victor Araujo, Atefeh Maleki, and Chandara Chea. The runners-up were Team AD-HOC with their app Sortly, which helps with recycling. You read a QR code on a bin with your mobile phone and see pictures and text in your chosen language explaining what to put in the bin. You can also read barcodes on packages and find out whether you can recycle it at home or if you have to take it to the recycling station. On the team: James Zhou, Greger Burman, Christopher Lundberg, Mattias Svedjevik and Simon Larsson. What did people say about the Arctic Challenge? We got some lovely comments! It was really nice indeed. I liked everything. The organization was amazing. Thank you for everything. I’m really happy and proud to see so many different nationalities creating magic for people entering and starting their new life here in Sweden. It fits well with the municipality’s priorities on digitalisation, entrepreneurship and integration. There is such a buzz amidst the silence of brilliant minds all working together for a common goal here at The Great Northern. 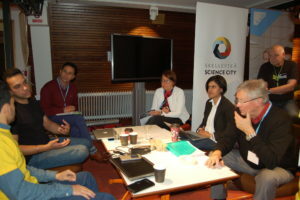 “Some of the proposals will be presented to the municipality of Skellefteå and the plan is that we will organize more similar hackathons”, said Emina Kovacevic. innovation manager at Skelleftea Science City.